Lloyd Ljunggren, age 96, of Harvard, passed away on Tuesday, January 17, 2017, at Perkins Village in Hastings. Funeral Services will be held at 11:00 A.M., Friday, January 20th at the Evangelical Free Church in Aurora. Rev. Vance Christie will officiate. Interment will be in the Aurora Cemetery. Visitation will be one hour prior to the service on Friday. Memorials may be made to the Evangelical Free Church or the American Legion. Higby-McQuiston Mortuary is in charge of arrangements. Condolences may be e-mailed to the family through the mortuary website at www.higbymortuary.com. 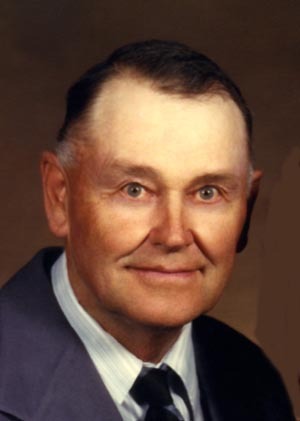 LLoyd Dean Ljunggren, the son of Rudolph and Ida (Bieck) Ljunggren, was born on January 15, 1921 rural Harvard, Nebraska and passed away in Hastings, Nebraska on January 17, 2017, at the age of 96 years. Lloyd grew up on a farm between Giltner and Harvard and attended school in Giltner. Lloyd served two years in the U.S. Army during WWII. Lloyd was married to Bertha Smith on February 8, 1946 at Mankato, Kansas. They farmed ten miles south of Aurora. Lloyd attended the Evangelical Free Church. He enjoyed playing cards and farming. Lloyd will be greatly missed by his wife, Bertha of Harvard; two sons, Roger Ljunggren and Dale (Leslie) Ljunggren all of Harvard; six daughters, Louise (Don) Graham of Central City, Linda (David) Brandt of Ovid, Colorado, Rogene Shoemaker of Grand Island, Carol (Ron) Hanover of Grand Island, Connie (Rod) Buchanan of Grand Island and Joyce (Larry) Petersen of Central City; 10 grandsons; 7 granddaughters, Kim, David and Sara Graham, Darrell, Mark and Paul Brandt, Julie Koenen, Jason Cerny, Gina Waterman, Jerry, Brandan and Catherine Ljunggren, Michael Hanover, Ian Buchanan, Jenni Larson, Megan and Carlyle Petersen; 8 great-grandsons; 11 great-granddaughters and two brothers, Lester Ljunggren of Harvard and Don (Shirley) Ljunggren of Dell Rapids, South Dakota. He was preceded in death by his parents; his son, Larry Ljunggren; two grandsons, Steven Cerny and Jonathon Graham and sister, Lucille Housel.